Bydureon is the trade name of the drug exenatide. Bydureon is a once weekly injectable medication for people with type 2 diabetes. 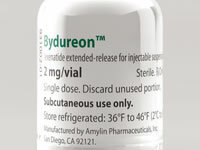 Bydureon was given approval to be prescribed in the UK in October 2011. Bydureon is the same medical drug as Byetta, except Bydureon is slower released requiring one injection a week, whereas Byetta is injected twice a day. Bydureon’s action takes place in response to food entering the small intestine. Bydureon responds to presence of carbohydrate, in the form of glucose, by stimulating release of insulin, inhibiting release of glucagon and slowing down emptying of the stomach. Each of these three mechanisms can help to keep blood glucose levels lower. People with a BMI value below 35 may be considered for Bydureon if insulin therapy would have significant occupational implications or if the weight loss properties of Bydureon would provide significant medical benefit. Which medications can Bydureon be used with? Alternatively, Bydureon may be prescribed as a dual therapy with either metformin or a sulphonylurea. Bydureon has been shown in studies to be beneficial for weight loss. However, because Bydureon is a relatively expensive drug to prescribe, it is only recommended in people in need of better blood glucose control. Hypoglycemia may result if used in combination with a sulphonylurea. Please refer to the patient information leaflet for more details about side effects.